The Secret Science Club: The Secret Science Club Goes Off the Grid with Ecologist Eric Sanderson, Thursday, October 13, 8 PM at the Bell House, FREE! The Secret Science Club Goes Off the Grid with Ecologist Eric Sanderson, Thursday, October 13, 8 PM at the Bell House, FREE! What was here before New York City? Ecologist Eric Sanderson wanted to know—and his curiosity turned into a decade-long environmental and cartographic investigation. To discover what Manhattan looked like 400 years ago, he mined through historic documents and scientific data—and plugged every hard-won bit of information into computer models. The resulting 3D maps and visualizations revealed a lost world of diverse ecosystems. 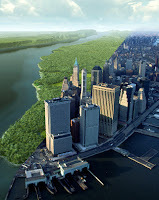 Forests covering what’s now Times Square. Beavers in Greenwich Village. Wolves pacing the Lower East Side. 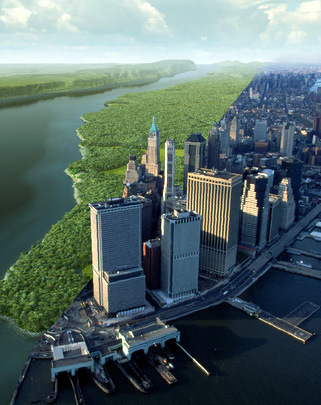 --What will NYC’s ecological footprint look like in the year 2411—400 years from now? --What remains of forgotten ecosystems? Do ghost-like streams still run? --How can citizens, scientists, planners, designers, architects, and artists reintegrate and re-connect with nature in the city? --What wildness pulses beneath the Secret Science Club’s Bell House lair? Does the city’s lost wilderness lurk beneath your neighborhood? Eric Sanderson is a Senior Conservation Ecologist at the Wildlife Conservation Society, author of Mannahatta: A Natural History of New York City, and founder of the Welikia Project, which aims to explore, digitize, and map Gotham's wild history. This edition of the Secret Science Club meets Thursday, October 13 at 8 pm @ the Bell House, 149 7th St. (between 2nd and 3rd avenues) in Gowanus, Brooklyn. Subway: F or G to 4th Ave; R to 9th St.
COMING UP… On Monday, October 17, 8 pm @ the Bell House, the Secret Science Club teams up with the Imagine Science Film Festival for “Controlled Experiment,” a night of science-themed short films, including Transgenic Spider Goats, Stanley Milgram: The City and The Self, Protein Expression, E. Chromi, Creature Cast: Footage From the Deep, and Four Letter Words. This lecture was not only informative but gave me a wistful feeling that hopefully someday the vision of green colored city will come true. I'll start by planting the three sisters! Thank you!